The MLS Cup, yeah, that. Landon Donovan went out with a championship. Yet more than that, LD got what it meant to bring together all the diverse craziness that is part of the soccer landscape in the USA. Americans played in the first World Cup ever, but that bright start (a semifinal finish) back in 1930 quickly fizzled out without consistent support in a big country. LD was a warrior on that front since he first played USA youth games as a teen, representing his country in front of sparse crowds locally. He gave interviews in broken Spanish even back then, he wrote a World Cup diary in 2002 for his local paper, the San Bernardino Sun, and he even had the temerity to call out David Beckham's loyalty to the Galaxy and his service to MLS. 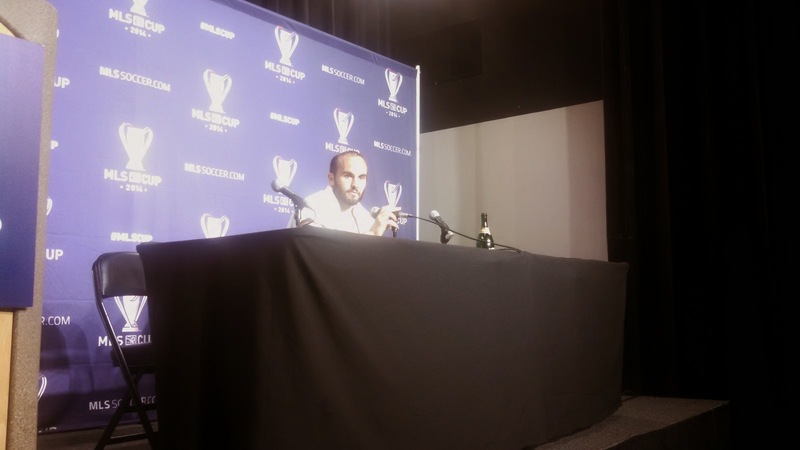 Time and again, when other USA players would get tired and walk away from reporters, LD would still stay, giving intelligent, thoughtful quotes to everyone who needed them to make a deadline. A local LA area kid, he even had a call-out for the LA Times columnist, Bill Plaschke, in his final press conference. "I just want to say, for the record, that I think we've made it when Bill Plaschke's at our press conference." Donovan's final comments overall weren't an answer to any question. His time was up, and he was ready to go, but he had a few more words for all of us, the assembled press. It was a message of gratitude. "For all of you who have been around for a long time, and even a short time - Bill (Plaschke)- I appreciate all you guys do for this sport. I know it's a professional relationship, but a lot of you guys are out there and really care about it the way that we do and it's been a long grind. I can't think of many less glamorous jobs than being a soccer reporter in this country, but you guys are passionate about it and you care and we really appreciate it. So I just want to say thank you for all that. I appreciate it." The media being the beast that it is, LD was immediately asked to say that again in Spanish. "That's a lot," Donovan admitted. He was well aware that local staff could easily translate his comments in English. He then obliged anyway. "Gracias a todos ustedes en la prensa. Normalmente no tenemos la oportunidad de decir gracias a ustedes tambien, pero ustedes estan aqui cada dia, apoyando a nosotros, y apoyando nuestro deporte en este pais. De parte de todo nosotros, querio decir gracias para todo." 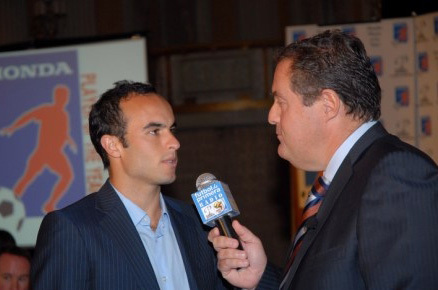 Just before my recording cuts off, various reporters respond, some of them for perhaps the last time, "Thanks, Landon!"